Cornerstone Fitness is a young, dynamic and innovative company, co-founded by David Lewis and Steven Smith, and is headquartered in Northern California. With nearly three decades of combined experience in health program implementation and exercise facility design, Cornerstone's founders can ensure delivery of the most intelligent workplace wellness and fitness solutions to clients of all sizes. David Lewis began his health and fitness career in 1985, and his industry experience prior to co-founding Cornerstone includes senior management for one of the largest corporate fitness management firms. As a Regional Director, he oversaw 20 corporate fitness centers for a diverse range of clients in ten states, including Federal Express, Gannett/USA Today and CitiBank. Before becoming Regional Director, Lewis started up and managed corporate fitness centers for aerospace, banking and software firms. David Lewis earned a degree in Physical Education from California State University at Long Beach, with an emphasis in corporate fitness management. Since 1986, Steve Smith's industry experience includes eight years as an award-winning Program and Fitness Center Manager for Toyota Motor Sales USA, Inc., and in 1997 Smith became a Regional Director for a large national corporate fitness company. 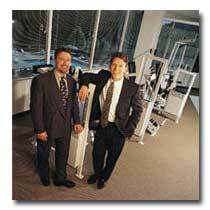 As Regional Director, he oversaw 19 corporate fitness centers for clients in the publishing, biotechnology, health, entertainment, and computer hardware and software fields. Clients included Hewlett Packard, Mattel Toys and the J. Paul Getty Trust. Smith graduated from Oregon State University with a degree in Physical Education, specializing in commercial and industrial fitness center management.